Carnaval Mobile Pokie is a 5 reels and 9 pay-lines mobile video pokies from Microgaming. It follows the origin of famous Mardi Gras celebrations which take place in New Orleans before Lent every year. Carnaval pokie brings the party onto your mobile. It features a range of bright, festive and fancy symbols including playing cards, trumpets, jesters, head masks, and more just to mention a few. Although there’s no free spins feature, the cheerful Carnaval music will put a bright smile on your face. Betting range in Carnaval pokie game starts from 0.25 to 5.00 and you have the option to bet a maximum of nine coins per spin. There’s a jackpot of 5 000 credits and loads of features such as multipliers, wilds and scatters to help you keep winning combinations pumping your account. The Carnaval pokie logo is the highest paying symbol. When three or more of Carnaval symbols appear on the reels respectively, it rewards 20, 200, 800 or 5 000 credits depending on how many of these symbols appeared on the reels. It also gives players playing option modes; you can choose to play in Regular or Expert mode. Expert mode offers players more advanced features that allow them to use the auto-spin option. The Carnaval pokie logo is the Wild Symbol and substitutes all other symbols except for the Scatters. The Scatter symbol in Carnaval mobile pokie doesn’t activate a bonus game like many other online slots. It merely multiplies the value of every winning. It creates 2x, 10x or 10x when three, four or more scatters appear anywhere on the reels. 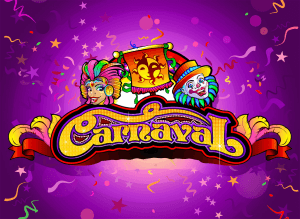 Carnaval Mobile Video Pokie is a totally revamped version of Microgaming's classic Carnaval video slot. It has a new face with fresh graphics, but it retains the same 5 reel s and 9 pay-lines that players have become comfortable with.